This functional model provides a graphic demonstration of the anatomy and mechanics of the joint, allowing better doctor-patient or teacher-student understanding. Use this life-size and fully flexible, bendable joint to demonstrate abduction, anteversion, retroversion, internal/external rotation and much more. 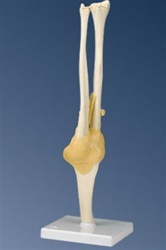 Consists of portion of humerus, complete ulna and radius as well as joint ligaments. On stand, removable.